How has Chronic Joy blessed you? Congrats on your new website. It is absolutely beautiful and so easy to navigate. I love all the rich content you have on it. What an oasis of hope for those struggling with chronic illness and their families and friends. I know you put so much thought and work into this and it shows. I can’t wait to go on again and l linger through everything. I know God will continue using this ministry powerfully. You continue to be fruitful in your affliction. 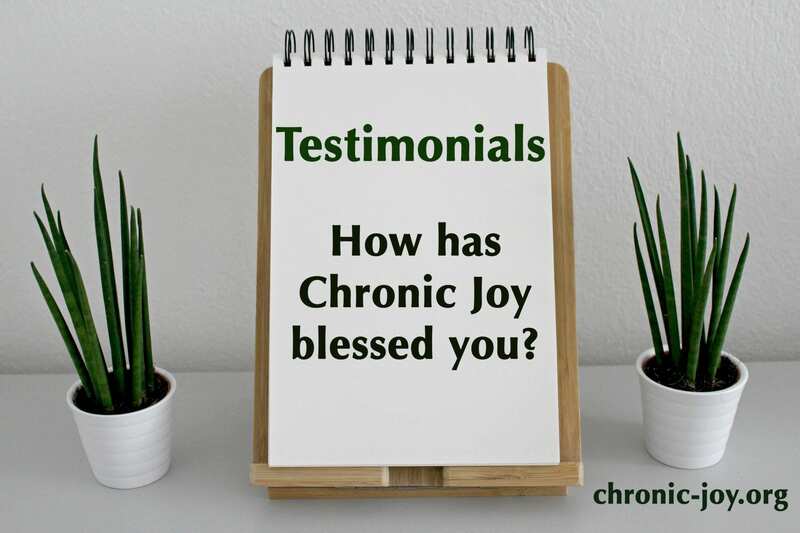 Chronic-Joy Ministry has been a great Blessing to me in my journey with Chronic Illness. When I was first diagnosed with Rheumatoid Arthritis in December of 2014, I was sent home with 2 prescriptions and a label. I felt so bereft, and unsure of what kinds of help I needed. I wasn’t even sure what kinds of questions I needed to ask in order to find help! But as the Lord led me to begin blogging a year later, I came across Pamela and Cindee’s writing on their website, and I eagerly jumped on board for the launching of their first book: “Discovering Hope.” God used that first book in amazing ways to help me look at this journey of my life with chronic illness. The questions asked in the book were ones that had simmered under the surface–ones that the Lord would use to help me fix my eyes back on HIS hope through the every-day ins-and-outs of living with chronic illness. The posts on their website have always been such an encouragement, and each book they have written has been another boost on this journey. I pray that God will continue to use their ministry to bring His joy to many on this pathway through chronic illness. I just found this page tonight and it is a gift from God. How wonderful to connect with others through Jesus Christ and to be able to see and care about the invisible illnesses that others must carry. Thank you so…so…much for all you are doing. We [ Stoney Church] are so excited about this opportunity to study Jesus’ words in such a dynamic way [Chronic Joy Thrive Series]. I pray God will bless this outreach. In short, I simply cannot find words to adequately express my gratitude to Jesus, to you, and to your your ministry. We truly are blessed abundantly! I have lived with chronic pain for many years. With our Lords love and through your ministry, I am very ‘hopeful’ about my future. I will continue to follow your website and pray for those individuals who live with chronic pain. I just found you on Twitter today, and am so thankful for God dropping your information in my lap. We wanted to let you know what a blessing you were yesterday, and how The Holy Spirit worked through you for His Glory and the encouragement of His People! It was a joy to see God work through you like that, and to be taught and reminded of God’s faithfulness, even through the storms!! Job very well done, and thank you for your faithfulness and friendship! But I am going to say they [Discovering Hope, Finding Purpose, and Grace, Truth & Time] – and I would love to see them bless others. I also really love the work Chronic Joy is doing to encourage people on Twitter and Facebook – I highly recommend you join them there! You might wonder why I am requesting books [Discovering Hope]. Because surely I want to help my people who are suffering for information in Kenya. … I thank God because I have received the books and I promise that I am going to use them and help my people. Our daughter leaned to me during your presentation and whispered how you used all the words we do to describe her days. Her tears came from the point when you talked about being a burden. She so connected with that even though we reassure her that she is never a burden; it is still hard not to feel that way. … We really appreciate that you stood in front of so many and gave a face and words to invisible chronic illness. It gives me great pleasure to see my Thrivent Choice Dollars invested in Chronic Joy Ministry, an excellent organization tackling the hard issues surrounding chronic illness. We are so happy that our Thrivent Choice Dollars can help people in need through Chronic Joy Ministry. Chronic illness is very difficult for the entire family.